Welcome to Tuesday Treasures and I am showing a book I made on Sunday at a class with Lin Brown (Formerly LB Crafts), made with one sheet of 12 x 12 card, Fresco Finish paints and Leandra's (PaperArtsy) fabulous new sewing stamps. (Guess what I have had to order them LOL). Stamping with brown Memento ink and colouring with Prisma pencils I coloured up the images and displayed them on the pages. 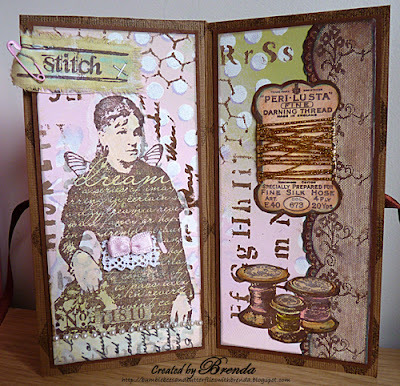 The background pieces are painted, masked and stamped to create these fabulous designs. I have added some buttons, lace and other embellishments to add dimension and detail. I didn't get finished during the workshop but came home and worked till 1.00 in the morning to complete it. I was totally inspired by Lin's fabulous sample and just had to get mine done straight away. My sister should have come with me but is poorly at the moment so Lin very kindly gave me her Vintage sample to do with Chris, so I will be doing another one myself too. So share your treasure with us this week, this is all about having some fun and hopefully meeting new people in our amazing blogging community. Link your 'treasure' post using the linky tool provided below and please include a back-link to here so that your visitors can come and join in too. If you copy and paste the code we can share the blog hop with everyone who visits us both. Have a great week. The Farnborough Air Show starts next week and already the planes are starting to fly in. We are almost under the flight path and get a great view of everything, just a shame there is so much low cloud and rain around again. A Blog Hop is a Linky that is shared on multiple blogs. Blog readers see the same list on each blog, and can HOP from blog to blog seeing that same list of links to follow. wow its amazing! love it! 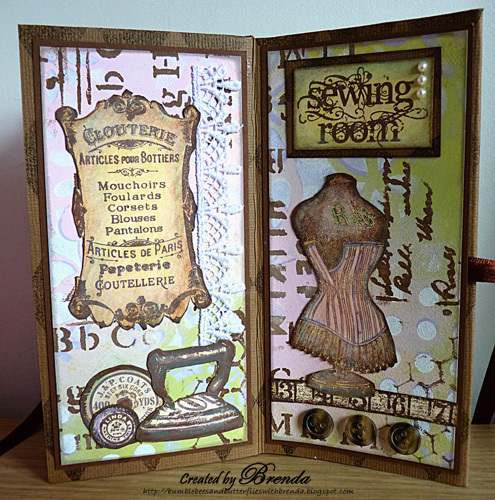 Fabulous vintage project Brenda - love all the detail and the gorgeous stamps. You are such a dedicated crafter, working until the early hours - the end result was worth it though! Wow, it's simply beautiful Brenda.I'm so glad youstuck with the background, it's so delicate and elegant, just perfect for all those beautiful images. That's dedication going home and finishing it the same night tho!! Hope Chrissie feels better soon. Wow, Brenda, that's a breathtaking booklet, fantastic details and really a treasure. Brenda, what a wonderful project! 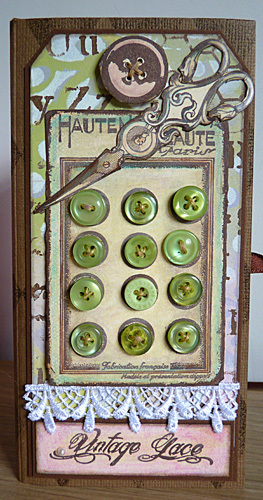 Love how you incorporated all those fabulous sewing images and of course the coloring is so vintage! Hope you sister is feeling better! Have a great evening, Hugs! Gorgeous beautiful book Brenda, sorry your sister wasn't well. 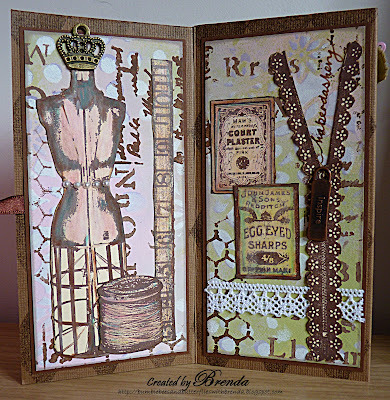 Hi Brenda, this is breathtaking; love all those stamps, especially the french trousseau one...it shows that you were inspired !!! Sending your sister good wishes..hugs G.
An absolutely stunning creation Brenda and you're so lucky to have done a class with Linda especially when you can made a beauty like this. Hi Brenda, this is fabulous, I can see why you where inspired to finish it. The stamps are amazing but you have used them beautifully and shown their amazing potential. Hope your sister is feeling better. Brenda, this book is stunning--each page has so much detail.....wonderful! I hope you have a break in the weather for the art show. 106 degrees here today and still no sign of rain. Okay, I REALLY like that book, Brenda! You inspired me to join in Tuesday Treasures with my own little sewing themed book! How beautiful, Brenda! Love your color combo and all that stamping. I can see why you had to order them!